As I hear myself say those words out loud, I laugh. I’m not one to ignore dangers of the wild. After all, they’re no game. But when spotting an alligator across an open clearing on Mill Pond while hosting a friend from Sweden on his first visit to Georgia, I’m willing to narrow the gap a few dozen yards so Hans can get a better look. The creature’s eyes gaze back at us over the water’s dark surface as he glides from the open water toward a cluster of majestic cypress trees along the distant shore. We pause in our kayaks. None of us blink. He then slips from view. “Incredible!” says Hans. Wild alligators can be spotted routinely in wet regions of southern Georgia—the state is home to about 200,000 of the 200-million-year-old species—but there are none in Sweden. 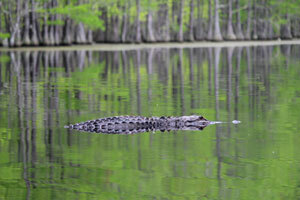 Though alligators swim in the 412-acre Mill Pond lake at George L. Smith State Park in Twin City, Georgia, it’s safe to boat in this water as long as you follow guidelines and use common sense — in fact, it’s part of the Georgia State Park’s Paddlers Club. And part of navigating the pond with common sense is relying on an experienced guide company such as Wesley Hendley’s Mill Pond Kayak tours, which weave through 10 miles of black water trails. For nearly 10 years Hendley has made the experience easy and accessible, providing kayaks, paddles, floatation vests, instructions and guidance. He also snaps photos throughout the trip to share with his guests at no additional charge. 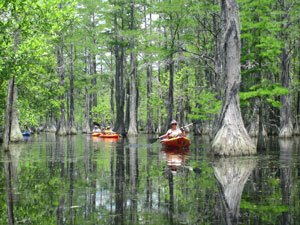 Paddling this otherworldly setting is a unique challenge of maneuvering between moss-draped cypress trees. It’s like a giant pinball game, and you’re the ball. Some areas are a tight squeeze — to fit you may need to lift the paddle over your head and swing it parallel with the kayak. But there’s no current or tide to worry about, and almost no other boat traffic, so the water is smooth and easy to master. The lake has natural niches and alcoves with different tree density, lighting, moods. Shadows play on water, light juts between branches. Because the place is so serene and tranquil, it’s hard not to relax. If paddlers somehow are separated from the group (which is unlikely), it would be hard for them to actually get lost. “It’s a pond,” says Hendley. “So you can paddle to shore and then along the shoreline in any one direction and eventually will end up back at the dock.” Still, it’s comforting to explore with a guide who knows the best routes to navigate in two or three hours. Paddlers can get the sort of experience they prefer – even a private one. Hendley schedules groups separately, and he won’t even pair up families without prior permission. 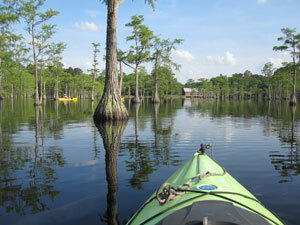 Mill Pond Kayak welcomes people of all ages on its tours, which typically run March 1 through November 30. In September 2018, however, Mill Pond was drained in order to repair the dam. The lake will be restocked with fish and reopened, as weather permits, sometime this spring. “We’re at the mercy of the rainfall,” says Hendley. Some paddlers might favor the lower part of the lake where trees are more spaced out. On hot days, the shady upper part may rank as most appealing. “Some people prefer to avoid tree obstacles, some people really think they’re cool,” says Hendley. Whatever the route, you can take your time and appreciate the surrounding natural wonders. And Mother Nature does not disappoint. Turtles line up on fallen branches. A white ibis nests overhead. Osprey, egret, heron and anhinga swoop in and out of view. Woodpeckers tap on trees. Ducks and non-venomous brown water snakes float around. Bream, crappie, redbreast and bass swim in the water. Occasionally, white tail deer walk the shoreline. The threatened gopher tortoise and eastern indigo snake live on the sand ridges surrounding the lake. In addition to its natural wonders, George L. Smith State Park boasts the refurbished Parrish Mill, a combination grist mill, saw mill, covered bridge and dam built in 1880. One of only two grist mills in working order and in operation by the state of Georgia, it’s capable of grinding as much as 200 pounds of corn an hour (now limited to demonstrations only). Reservoirs for water-powered mills, ponds like this one used to be common but have mostly disappeared as technology has changed. Before the state park was established, this pond was privately owned for about 100 years and has been referred to by locals as Parrish Pond and Watson Mill Pond for its previous owners. At the state park you can walk through the covered bridge and read placards to learn more. The park also offers 11 miles of hiking trails, though the mill and its pond are the park’s most stunning showpieces. Kayakers could spend a few hours paddling and leave, but longer visits can be even more relaxing. 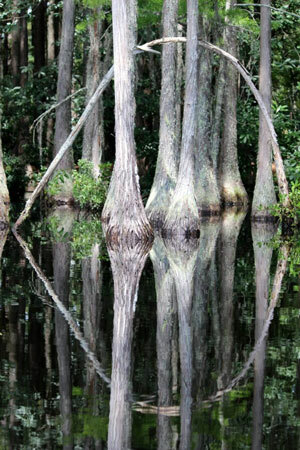 George L. Smith State Park offers 25 tent, trailer and RV campsites, plus eight cottages. The cottages have been recently updated and are better appointed than some hotel rooms. They’re easy to share with a friend. Hans and I each snagged a private bedroom and bathroom while sharing a living room, screened porch and full-service kitchen. The cottage was clean, comfy and homey. With such beautiful surroundings, it’s easy to envy the alligators who get to live in such a place. More information is available from George L. Smith State Park at (478) 763-2759 or gastateparks.org/GeorgeLSmith or Mill Pond Kayak at (478) 299-6616 or millpondkayak.com. Published on April 1, 2019 in Georgia.